Adolph Alfred "Al" Taubman (January 31, 1924 – April 17, 2015) was an American businessman, investor, and philanthropist. Pictured is The Mall at Short Hills in New Jersey, which was developed by Taubman's company. He was convicted in 2002 for a price-fixing scheme involving the top two auction houses in the United States. Taubman was born in Pontiac, Michigan, on January 31, 1924, to Jewish immigrants Fannie Ester Blustin and Philip Taubman. His parents came to the United States from Białystok, in northeastern Poland. His mother was his father's second cousin. Philip took a job with the Wilson Foundry Company in Iowa, transferred to Pontiac in 1920, became a fruit farmer, then began developing commercial real estate and custom homes. Taubman's parents lost everything in the Depression of the 1930s, and Taubman at age 9 had to find work to help support the family. He is a graduate of Pontiac Central High School. Taubman studied architecture at the University of Michigan where he was a member of Zeta Beta Tau Fraternity and Lawrence Technological University, but graduated from neither. His developments such as the Mall at Short Hills in New Jersey continue to be ranked among the most profitable shopping centers in the country. He made a fortune which Forbes magazine estimated at $3.1 billion and was on the list of Forbes 400 Richest Americans for two decades. In October 2003, his real estate firm Taubman Centers survived a hostile takeover bid by the Simon Property Group and Westfield America. Taubman bought the ailing British auction house, Sotheby's, in 1983, acting as a white knight when the company was threatened by a hostile and unwanted takeover by Marshall Cogan and Stephen Swid of General Felt. He revived the fortunes of Sotheby's, which had been slumping in the eighties; he took the company public in 1988. His family divested controlling interest in Sotheby's by September 2005. In the early 2000s, an investigation into alleged price-fixing between Sotheby's and rival auction house Christie's led to a confession by Sotheby's CEO Diana Brooks of an elaborate price fixing scheme with her counterpart at Christie's, Christopher Davidge. In a plea bargain arrangement, prosecutors offered to keep her out of prison if she agreed to implicate Taubman. She did, and thereafter Taubman was convicted in a jury trial of price fixing. He was fined $7.5 million (USD) and imprisoned for ten months in 2002 for antitrust violations. Taubman was released in 2003, and continued to insist on his innocence. Taubman bought A&W Restaurants in 1982, and sold it to Sagittarius Acquisitions in December 1994. From 1983 to 1984, Taubman was the majority owner of the Michigan Panthers of the United States Football League. Although the Panthers acquired a fairly loyal following and won the first USFL title in 1983, the USFL's decision to move from the spring to the fall led Taubman to merge his team with the Oakland Invaders for the 1985 season, with himself as majority owner of the Invaders. That team folded along with the rest of the USFL after the 1985 season. Gayle Taubman Kalisman (b. 1951) is co-chair of the Taubman Institute and a University of Michigan alumn. Robert S. Taubman (b. 1953) serves as chairman, president and chief executive officer of the Taubman Company. William S. Taubman (b. 1958) serves as chief operating officer of the Taubman Company. In 1982, he married Judith Mazor Rounick (b. 1943 as Jehudit Mazor), the daughter of a paste jewelry importer-exporter and a former Miss Israel in 1962. Judy grew up in Israel and had two children from a previous marriage to clothing manufacturer Herbert Rounick: Christopher Rounick and Tiffany Rounick Dubin (formerly married to real estate developer Louis Dubin). Judith's brother is Boaz Mazor who is the sales director for Oscar de la Renta. Taubman died on April 17, 2015, of a heart attack at the age of 91 in Bloomfield Hills, Michigan. The A. Alfred Taubman Student Services Center at Lawrence Technological University has an extensive glass facade and modern design. Picture taken in November 2006. Taubman has donated large sums to the University of Michigan, and many buildings there are named after him, including the A. Alfred Taubman Biomedical Science Research Building, the Taubman Health Sciences Library and Taubman Health Care Center. A school within the university is also named for him: the Taubman College of Architecture and Urban Planning. Taubman is also a major sponsor of disease research: his latest donation, a gift of $5 million to support the University of Michigan's Dr. Eva Feldman's and Dr. Yehoash Raphael's research, was aimed at the development of new treatments for Lou Gehrig's Disease and deafness, respectively. 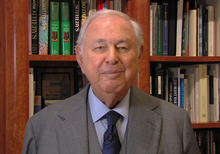 In 2011, Taubman donated $56 million to medical research. These donations brought his lifetime giving to Michigan to $141 million. He also donated to the Taubman Center for Public Policy at Brown University, and The Taubman Center for State and Local Government at Harvard University. The A. Alfred Taubman Student Services Center at Lawrence Technological University was completed in 2006, and ground was broken in September, 2015 for the A. Alfred Taubman Engineering, Architecture, and Life Sciences Complex at Lawrence Tech. Taubman had also taught a class at LTU focusing on his retail real estate development experience. The A. Alfred Taubman Center for Design Education at the College for Creative Studies was completed in 2009, in which Taubman contributed $15 million to the $145 million restoration and remodeling of what once was the General Motors Argonaut Building. ^ "Alfred Taubman - Forbes". May 10, 2015. Archived from the original on May 10, 2015. Retrieved October 25, 2015. ^ a b Robert D. McFadden (April 18, 2015). "A. Alfred Taubman, Former Sotheby's Owner and Mall Developer, Dies at 91". The New York Times. Retrieved April 19, 2015. Adolph Alfred Taubman was born in Pontiac, Mich., on Jan. 31, 1924, one of four children of German-Jewish immigrants, Philip and Fannie Ester Blustin Taubman. His father was a builder, but the family was hit hard in the Depression and the schoolboy, who stuttered, was dyslexic and had difficulty reading and writing, took part-time jobs. ^ Vogel, Carol; Blumenthal, Ralph (April 23, 2002). "Ex-Chairman Of Sotheby's Gets Jail Time". The New York Times. ISSN 0362-4331. Retrieved January 19, 2019. ^ "A. Alfred Taubman, billionaire convicted of price fixing, dies at 91". Washington Post. April 19, 2015. Retrieved January 19, 2019. ^ Sprow, Maria (April 22, 2002). "Taubman sentenced to year in prison, $7. 5 million fine". The Michigan Daily. Retrieved January 19, 2019. ^ Reich, Robert (2018). The Common Good (1st ed.). New York: Alfred A. Knopf. ISBN 9780525520498. OCLC 1014000027. ^ a b c Caitlin A. Johnson (April 15, 2007). "For Billionaire There's Life After Jail". CBS News. Retrieved December 29, 2009. Alfred Taubman is a legend in retailing. For 40 years, he's been one of America's most successful developers of shopping centers. ^ Murphy, Tara. "Taubman Bid Gets Sweeter"
^ "A. Alfred Taubman". The New York Times. ^ "Dan Ackman, "Outclassed"". The American Lawyer, Feb. 2002. Archived from the original on March 18, 2008. ^ a b Thane Peterson (April 30, 2007). "From Slammer Back To Glamour". Business Week. Retrieved December 29, 2009. ^ "Mall mogul A. Alfred Taubman passes away at 91". WDIV-Detroit. clickondetroit.com. April 17, 2015. ^ "A. Alfred Taubman Student Services Center". Lawrence Technological University. ^ "A. Alfred Taubman Engineering, Life Sciences, and Architecture Complex". Lawrence Technological University. ^ "Alumnus leaves enduring legacy at LTU". ^ Howes, Daniel. "CCS Center Proves Detroit Can Rebuild". Detroit News. September 22, 2009. Archived from the original on December 22, 2009. Retrieved 2009-12-14.